GreenWorks - Find The Best Electric Pressure Washer! CPO Greenworks is the leading online tool retailer in America that founded in 2004. Unlike the other companies, CPO Greenworks become famous within a short period of time. People know CPO because of its industry-leading selection of factory reconditioned tools and equipment. Their products offer the customers high-quality tools at significantly discounted prices. The company generally makes electric powered pressure washer. United Stationers acquired CPO in May 2014 and in 2015 they announced to reposition the company. With time they became the fastest, most convenient solution of workplace essentials. 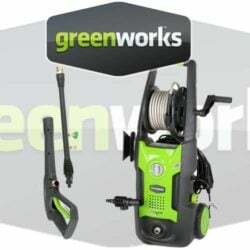 In the pressure washer world, Greenworks became famous for its products’ good quality. People rely on their machine’s quality to be one of the finest. They include all the modern technologies in their pressure washers to satisfy the consumers’ need. People actually like their products because of its powerful universal motor, less noise, and warranty. For using in residential purpose buying a Greenworks’ electric pressure washer can be the best option.